That's not silly at all! I'm sorry I missed you. I will make it green once I get home. Congratulations! Great job! Hi everyone! I hope everyone enjoyed their holidays! This challenge is now closed. 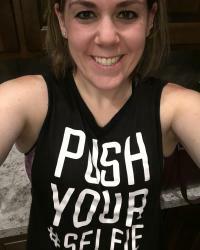 Check out the Valentine's Day Challenge at: http://www.bariatricpal.com/topic/358148-valentines-day-weight-loss-challenge/ hosted by @@vsgSarah3 ! We had 124 people complete this challenge and lost a total of 1353.2 pounds! We had 11 people lose over 10%, which is absolutely incredible! @@Amberina lost the most with 14.14%. We had 33 people reach their goal weight, which I think is pretty awesome considering the time of year it was! I wish everyone the best of luck in their continuing journey. I'll see you back at the challenges once I can lose weight again! I actually will not be continuing running these. @@vsgSarah3 offered to step up and continue them though! I'll be in contact with her today and will make sure the link to the new thread is posted here =) Previously they ran back to back and for 6-8 weeks at a time. It's up to Sarah though! Thanks! VSGSarah3 said she could take over as well. I'll put you down for a back up. Do you like being a SAHM? I'm considering not going back to work this time. Thanks! It's on the first post of this thread. There is a link you click on and it should take you directly to this challenge. Thanks! We love Starbucks =) We don't have one in our town, but our 2 year old still knows what the green lady means lol. Steph,Please add me to the spreadsheet. I joined over 2 weeks ago. Sorry, you're added now! I went on vacation right after you joined and never had a chance to add you. Sorry for the delay! Hi! Welcome! I will get you added tomorrow! Good luck with your upcoming surgery! Hey everyone... Our challenge made it into the December newsletter!!!! WOOHOO!!! I stayed the same this week. Don't forget I'll be at Disney next week, and won't be updating the spreadsheet until much later/the Monday after. Also, I'm looking for someone to take over the challenges at the end of this one. I've got a lot of (great) things going on, and I don't feel that I can update the spreadsheet in a timely enough manner anymore. Hi! Are you new to the challenge? If so, what is your goal weight for 12/31? If not, did you change your screen name? Thanks! I'm so sorry to hear this! I hope you're feeling better. Hugs to you. I know you can do this!!! One of my all time fav GIFs. Thanks for making my day!!!! I'm sorry, I do not know. I typically do not view the Google doc on my phone, and I have an iPhone. Hopefully someone else answered your question! Do you have a goal weight? Thanks! Hi all! I'm about 6 weeks pregnant. I'm a little over a year out from VSG surgery and lost all but 5 pounds of my excess weight!!! Before finding out I was pregnant, I was eating an average of 800 calories a day. Now, I'm STARVED. I had not been hungry once since my surgery until about a week before I found out I was pregnant (should have been my first clue!). I'm eating about 1500-1600 calories a day now (which is a struggle) per my dietician. This still doesn't seem to be curbing my appetite however. Has anyone else had this problem? Thanks! hi stephh! i just had my baby 9-28-15. i started at 257 and was reached my goal of 150 when i was 14months out, then two weeks later i found out i was pregnant. i too was only taking in about 700-800 pre pregnancy. around 13 weeks pregnant i started getting insanely hungry, literally every two hours. for me it really didn't ease up until i was about 32weeks. my dr wanted me to take in about 1800 calories a day i ended up putting on 42lbs in total. i lost 15lbs after my c section taking me from 192 to 177. i have been stuck there for the past two minths unfortunately, the scale just doesn't want to move for me. keep taking in as much Protein as you can. keep high protein Snacks with you if you're getting hungry often! congratulations on your pregnancy, you can pm me if any questions Thank you so much for responding!!!!!! I feel like I'm in the exact same scenario you were. I feel so much better knowing that someone else is hungry too. I was afraid of it being head hunger. Congratulations on your new baby! How was your pregnancy besides being hungry? Had you been pregnant before? Was it different? Sorry, I have SO many questions!!! Your weight gain doesn't seem bad to me. It seems like a manageable weight and will probably come off. I already have argued with my Dr about gaining weight... He said I could aim for 10-20 pounds because I'm at the top end of my healthy weight range. So far, I've stayed steady, but I'm not very far along. I was 155.4 this week! The spreadsheet is updated as of 10:30 EST on Tuesday 11/24. I'll update again a little later this week. We lost 230.6 pounds last week!!!! Happy Thanksgiving for those of you who live in the US! I know Canada celebrated their Thanksgiving in October. Any other fun holidays I don't know about in other countries?! Also, don't forget I'll be gone Dec 5-12, so the weights from Dec 7 will not be updated until the next week. No problem!!!! I hope you are having an amazing time!!!! Hi! I need a starting weight and goal weight. Thanks!